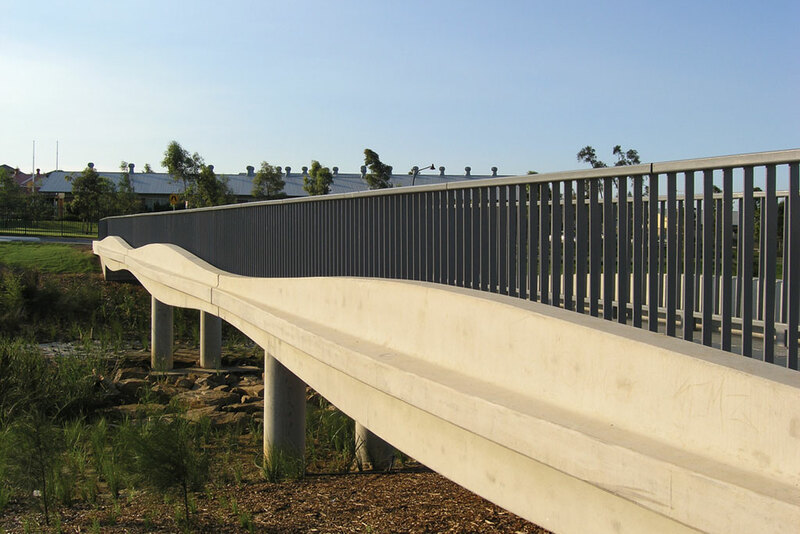 The pedestrian footbridge at Newbury Council Reserve 801was designed for Landcom and Mirvac to connect the new Kellyville Ridge Public School and its sporting oval; spanning a re-vegetated creek and riparian zone. 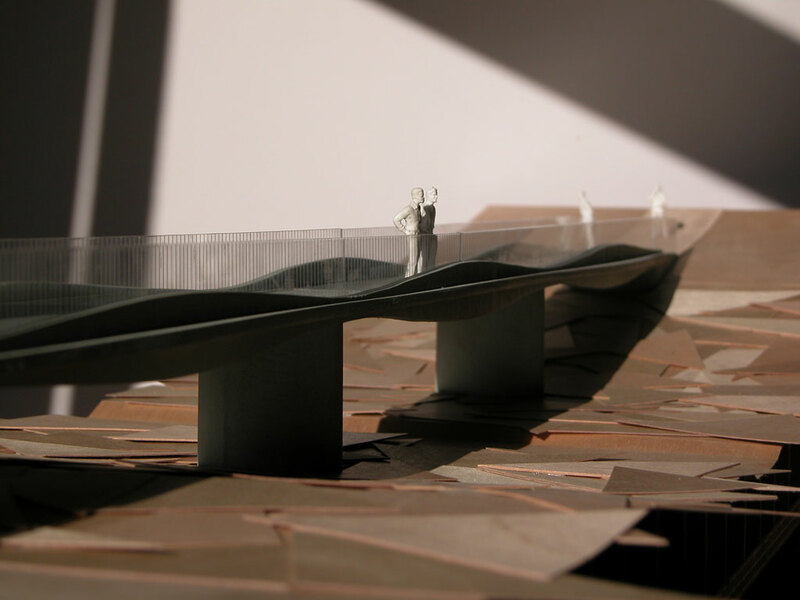 Conceptually, the bridge is a series of three simply-supported, pre-cast concrete girders, spanning 10 metres each. The girders are supported by two pairs of columns in the riparian zone, and approach ramps at either end. 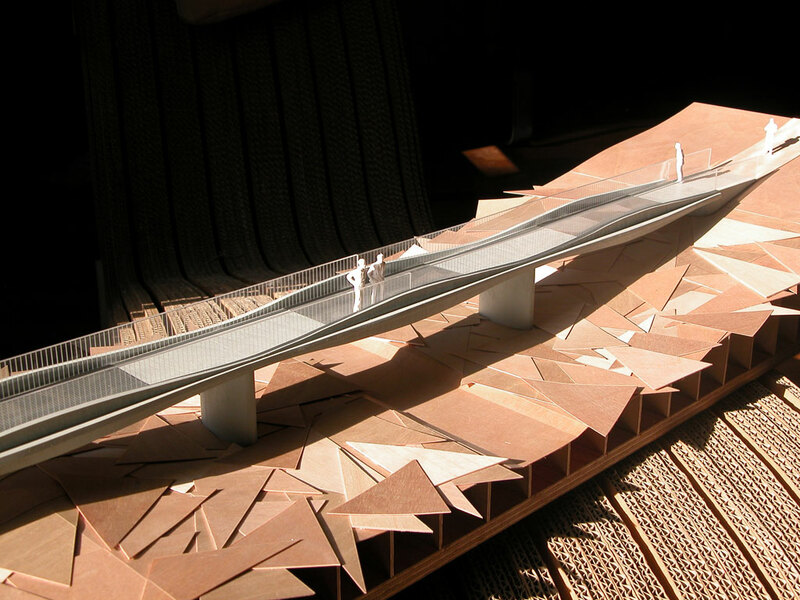 The in-situ concrete deck ties all the elements together. The shape of the girder is a sine-wave, a response to the bending moment of the beam, with the crest at mid-span and the trough at the end supports. The sine-wave form of the beam is repeated in plan, with reduced amplitude, providing depth and detail in elevation. The girders are the principle design element, and pre-cast concrete was selected as a building material over steel or in-situ concrete for its high level of finish and, quality control. 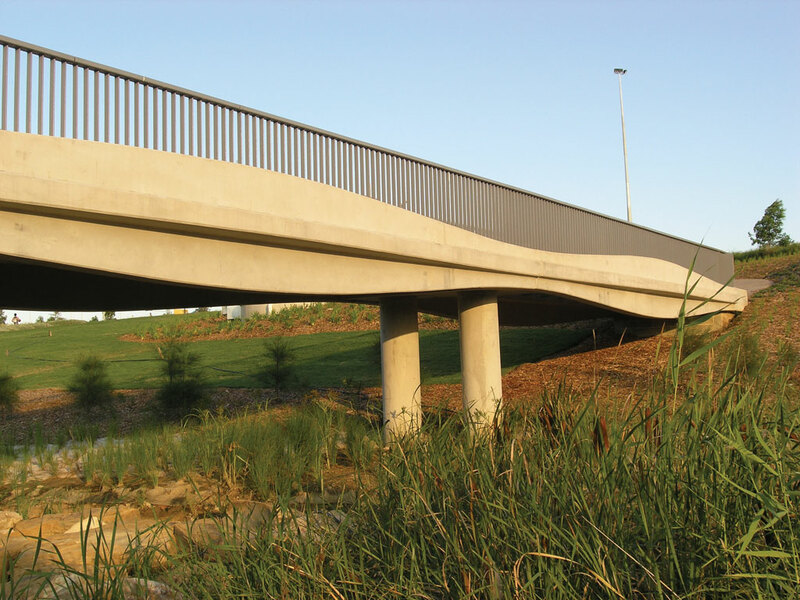 Initially, the bridge was intended to be an all pre-cast structure, including the deck, in order to minimise disruption to the creek bed. However, this was not feasible due to the structural requirement for the deck to tie the structure together. 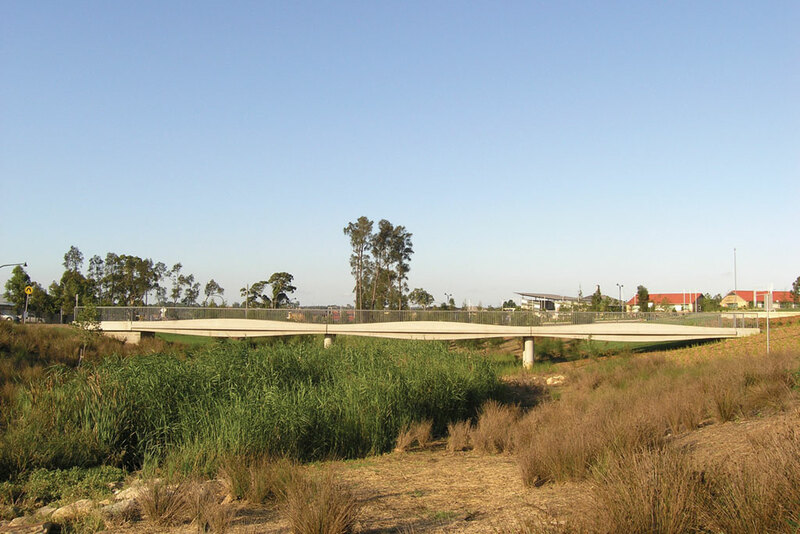 Ultimately, the re-generation of the creek bed and riparian zone took place concurrently with the construction of the bridge allowing the contractor the necessary access. The handrail is a series of simple steel flats and rectangular hollow sections painted dark grey, to contrast with the lightness of the concrete beams. The simplicity of the handrails emphasises the subtlety of the convex and concave sinuous form of the girders. Galvanised steel grating has been inserted within the mid-span of the deck to facilitate the riparian growth underneath the bridge. 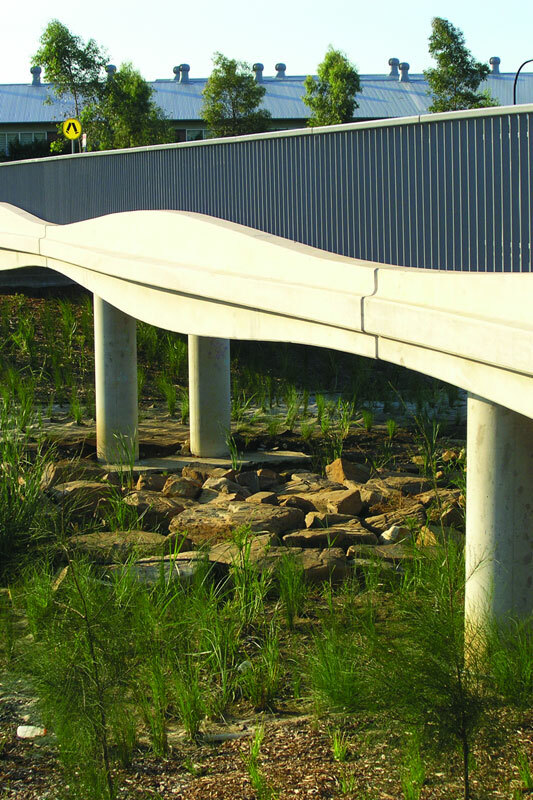 The result is an elegant and functional bridge that has delivered quality to a discerning client. Tim Hungerford was the consultant architect to Oculus for the project.